Kevin Durant’s signature series has always featured a grade school colorway that paid homage to KD’s love of peanut butter and jelly sandwiches, but he’s not the only Nike Basketball signature athlete that has a fondness for the sweet sandwich. Kyrie Irving enlisted famous customizer Mache for this latest Nike Kyrie 2 known as the “Just Jelly” colorway. 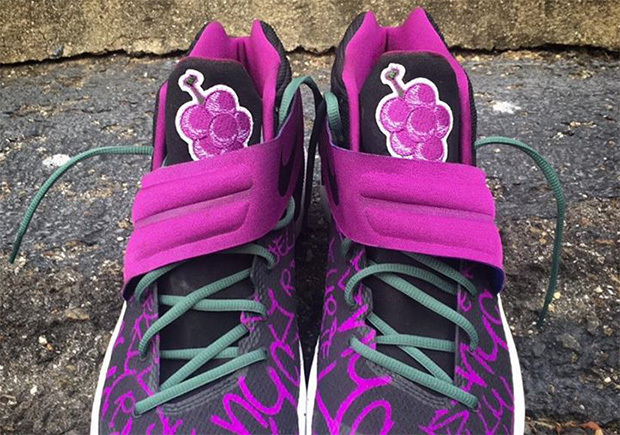 The one-of-one Kyrie 2 Just Jelly features bold cartoonish grape logos on the tongue while hints of that vibrant purple from the Nike Kyrie 2 “Huarache” pair can be found on the strap and graffiti-laden upper with words like ‘NYC’, ‘Just Jelly’, and ‘Kyrie’ are written in a unique font throughout. What do you think of Mache and Kyrie’s creation? Check out a better look below and stay tuned for the latest Kyrie 3 updates by heading over to our Release Dates page.